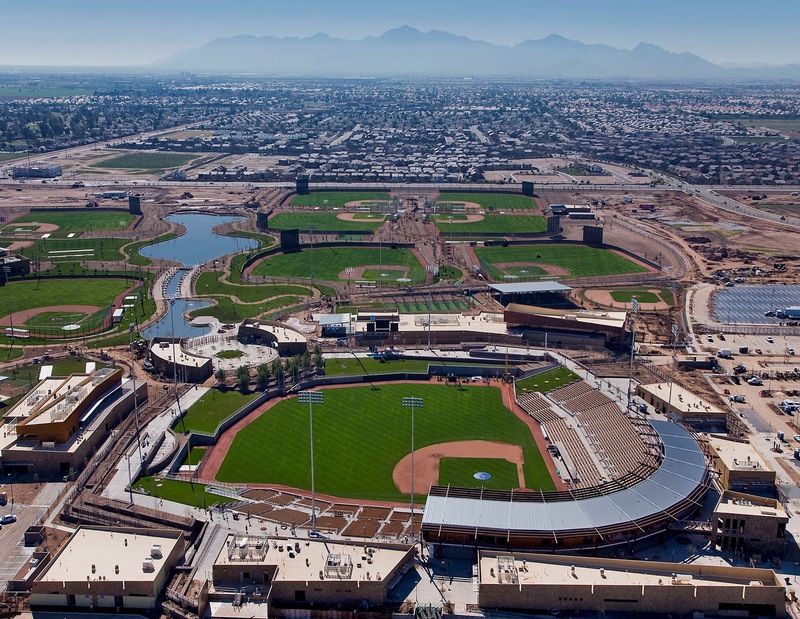 With the Australia MLB opener complete, the MLB Sunday Night Opener beginning, and the big opening day less than 24 hrs away, I’m running out of time to finish my reviews of the Cactus League spring training stadiums. I’ve completed Municipal Stadium, Diablo Stadium, Cubs Park, Salt River Fields, Maryvale Baseball Park, and Goodyear Ballpark. Next, I move to the biggest SuperPark in the Sun Valley which is fitting that it houses the Dodgers and the largest payroll in Major League Baseball. If you walk in through the centerfield entrance, you will know you are entering a completely different type of Spring Training stadium. With the fountains in the 2-acre lake and the lush grass and trees lining the walkway, this entrance makes you forget you are in a desert and instead makes you feel like you are strolling through a state park. It is kind of a hike from the parking lot in centerfield, but it was free parking (at least for the night game we went to) and the views make up for it. Once you are in through centerfield, you won’t be able to see the field because of the large trees and the hitter’s eye blocking the view. But the trees are a welcome form of shade and the grass around them house the carnival games and allow kids to crawl around. Going left takes you to rightfield which holds the scoreboard and visitor’s bullpen. Rightfield has the home team’s bullpen and a small patio with tables, chairs, and umbrellas. Once you see the inside of the stadium, you will be in awe of how large it feels and its architecture. The entire outfield has elaborate landscaping that makes you feel like you are watching a game in a small town park. The rock formations line most of the outfield and allows for leaning against for a ledge while standings and watching the game on one side and a back rest while watching the game on the other side. 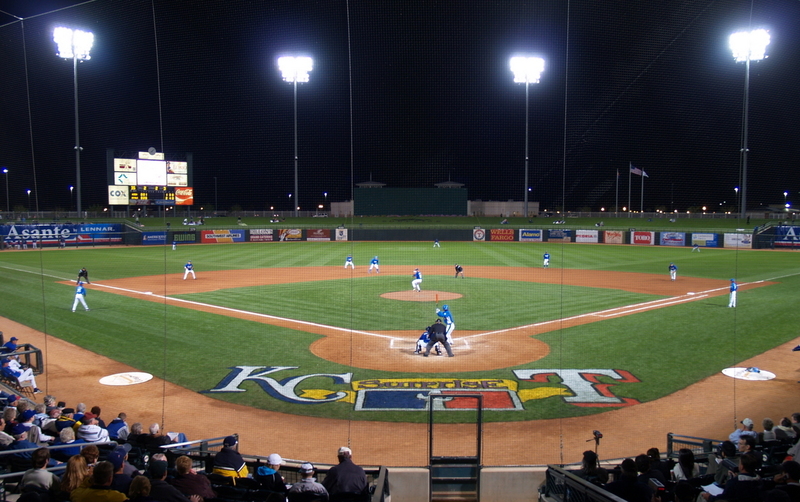 The grass seating wraps around both foul poles which maximizes seating for low-cost seats. This also allows a large area to peer into both bullpens and chat with coaches and players as well as get a free souvenir. After analyzing the outfield, you will notice the rusted exposed steel I-beam architecture of the second tier seating and press-boxes. They provide ample shade for the infield seats from 3rd base to 1st base and shades the concourse below. The concourses feel small and narrow with a lot of buildings inside the park. The infield seats have plenty of room but there is a walkway about 10-13 seats from the field which pushes all the higher rows further away from the field. The area itself is nice. Its on the west edge of the Sun Valley metropolis which puts it at the base of the mountains (there is a neat park for hiking only a few miles further West). But it lacks anything to do pre/post game. There are some big box stores a few blocks away along with some fast food. In order to get to any shopping areas, you have to drive a bit further West. For a bar, you have to go about 3-5 miles either East or West, but there isn’t anything within walking distance. 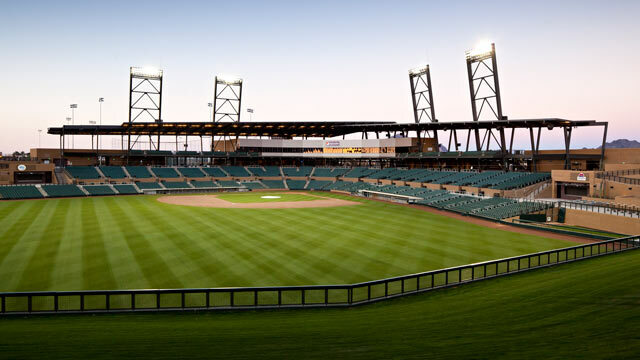 This entire stadium is amazing and one of my favorite places in the Cactus League to watch a game. It’s actually more fun to walk around and enjoy the stadium than watch the game. I think the biggest reason for this is due to how large the field feels. You feel kind of removed from any portion of the game except for what’s happening in your vicinity. If you decide to watch a game here, either pay the money for the close seats or enjoy the game by walking around and watching from all different areas.